Watchdog group files petition with Supreme Court, claiming that EU-funded illegal Arab outpost expanding on archaeological site. 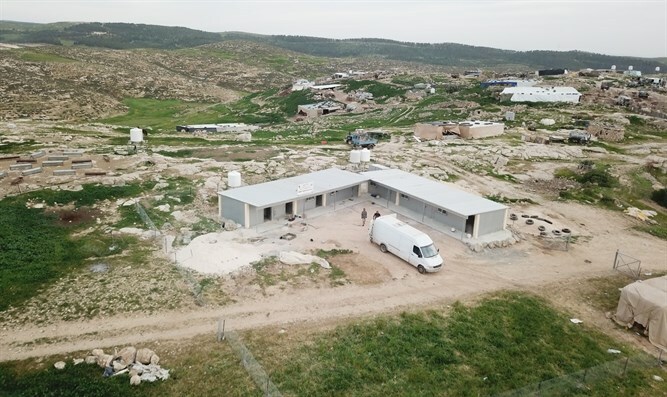 Over the past few weeks, Arabs living in the Hirbet Z'nutah [Zenuta] outpost, which is situated in the center of an archaeological site adjacent to the local municipality's offices in the southern Hevron Hills area of Judea, erected an illegal building, with the help of European Union funding. 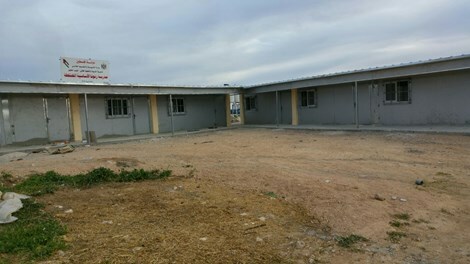 Six months ago, the High Court dismissed a case against the unauthorized outpost that had been in the courts for over a decade, High Court of Justice case #9715/07, stipulating that the demolition orders issued for the outpost's structures would not be implemented at the present time, on condition that no additional construction is carried out at the site. On Monday, Regavim, a watchdog organization which monitors illegal Arab construction, announced that an additional petition would be submitted to the High Court of Justice in the next few days. "Construction of a school on a protected archaeological site, with EU funding, is a gross and blatant violation of the High Court's decision, as well as a violation of the European Convention on the Protection of the Archaeological Heritage, signed in Valetta on 16.I.1992," said Yishai Hemo, Regavim's Field Coordinator for Judea and Samaria. "The offenders have sharpened their tactical skills, and have managed to pull the wool over the Court's eyes. They never intended to uphold their commitments in this matter. We will also be petitioning the Ministry of Foreign Affairs to demand that decisive action is taken in light of the European Union's illegal conduct." 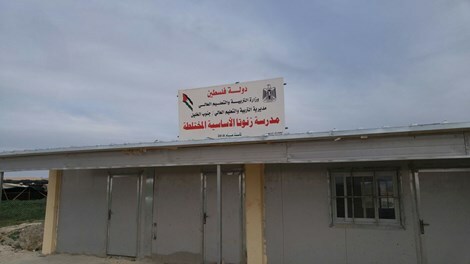 The illegal Arab outpost at Hirbet Z’nutah was constructed in Area C, which is under full Israeli control, and outside of the Palestinian Authority. Nonetheless, the new building is adorned with Palestinian Authority flags. Israeli authorities have removed parts of the illegal outpost over the years, including an operation in 2012 which destroyed several makeshift animal stables and tents, while leaving most of the squatters at the site.